From multicore to many-core: How to write portable, scalable, parallel applications that take advantage of the mushrooming number of cores. In the session we will look at some of the programming tools and parallel programming models that you can use to make your code parallel. 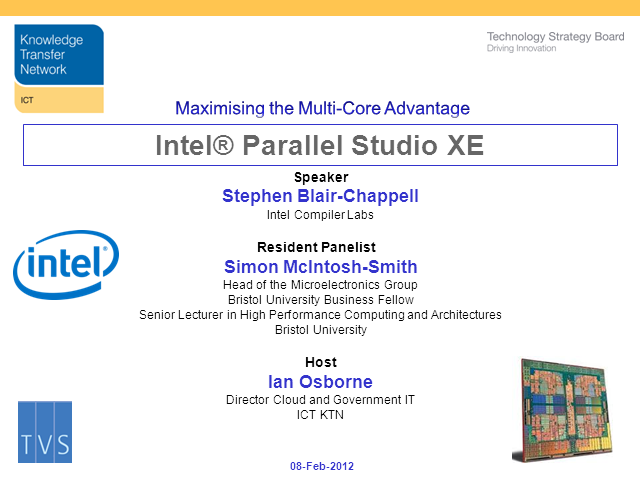 We present an overview of Intel Parallel Studio XE, along with a discussion on what methodology to use when adding parallel code to existing programs. In this 60 minute webinar, the ICT KTN, UK Trade and Investment and a guest speaker from CeBIT will describe how you can apply for free PODS in the UK Research & Innovation zone at CeBIT. It will also provide information on how you can benefit from participation at this major event. We will also inform you of what support we can offer to UK exhibitors in terms of grants, UKTI pavilion participation, matchmaking, start-up competition, ICT summit etc. Although Horizon 2020 does not officially start until January we are only days away from the release of the first call for proposals. The ICT elements alone add up to over €700 million and there is a wide range of opportunity for UK research. This is your chance to get involved in a simplified scheme with programmes specially designed for SMEs! ICT KTN has just completed a UK tour of events with 800 organisations getting on board. We have also had over 34,000 hits on the topic on our web site. •Details of the ICT Work Programme and in particular the elements in the first call. Robert Leese, Director of the Industrial Maths KTN, brings his knowledge and understanding of the skills and techniques required to allow developers to analyse and characterise data sets. This is an essential skill for 21c software developers. Join us to learn more about the knowledge and tools available and how best to apply them. Colleagues: Joe Baguley, VMware; Chris Swan, Cohesive FT and Alex Heneveld the CTO of Cloudsoft join us to bring the next frontier of IT as a Service into focus. How will we utilise public cloud services to replace our existing Data Centres? Who is doing that today, what are the processes involved and what issues and obstacles arise? Ian Bryant of the Trustworthy Software Initiative, represents that cadre of software engineers which is most concerned with ensuring that software development produces an output which meets exacting standards for quality and trustworthiness. Not all applications require such an approach, but where software is developed for highly sensitive services or in high reliability environments, an understanding of best practice in engineering is of great benefit. Ian will present the TSI model for discussion. Fran Bennett and Bruce Durling from Mastodon C are experts in Big Data analysis and orchestration. In this session they will describe the key processes and challenges to be faced and demonstrate with examples how cloud services can be exploited to deliver new insight into published data sets. Joining us from California Adrian Cockcroft, Cloud Architect at Netflix, will provide an insight into how the use of commercial cloud capabilities allow Netflix to continue to innovate and reliably deliver its streaming video and other entertainment services. What are the key concerns related to availability and resilience? How can they be addressed and assured? Ian Osborne, ICT KTN, will provide an introduction to the Autumn Webinar Series and then, with David Terrar, D2C, a member of Cloud Industry Forum Governance Board and ISO Cloud Standards body, he will provide an update on the progress being made on the ISO standards related to Cloud; the European Commission's Cloud Strategy and Data Protection Regulation; and finally an update on the Codes of Practice emerging in the UK and Europe aimed at smaller businesses. The €70 Billion R&D programme, Horizon 2020, is almost here. ICT KTN and the National Contact Point are bringing you a webinar with all the information you require to get started. •Bring Your Own Device (BYOD) is the Device Centric part of the Consumerisation of IT (COIT). BYOD unblocks many opportunities for significant Productivity gains for both large companies and small companies. The low cost of developing an App for a Smartphone or a Tablet can make the payback time very attractive. Allowing it to run on the employee’s preferred personal platform guarantees a higher take-up and usage of the app and allows a reduction in the replacement costs of PCs . •60% of UK businesses are believed to be implementing BYOD either formally or informally but less than 40% are taking adequate security precautions. New Generation Viruses can bypass traditional Firewalls and Virus Protection and are targeted to steal Trade Secrets and High Value Financial Information from industry generally. The employee’s own Tablet or Smartphone with all their games and social networking might be the carrier that infects the network. •Companies need to protect themselves against the bad apple Insiders who will use the technology change to commit fraud or to steal the company’s trade secrets, source code, commercial information, without restricting their employee’s ability to carry out their day to day job. •Find sources for more information about the implementation of BYOD. Cloud Computing is a relatively new and innovative area of business activity in the IT industry. The delivery of network based services is not a new idea, but the recent advances in network capabilities, the commoditisation of computing equipment and rapid advance of software as a service has taken this to a new level of business utilisation affecting all sectors and all types of business. What are the building blocks for these services? How are they regulated and controlled? How will the market continue to develop? A key element in the answers to these question are standards. John Easton is from IBM, a company which requires no introduction. However, you may not be aware of the extent of IBM investment in applied research in areas such as HPC and multicore. John Easton will guide you along this path. The term “multicore” is increasingly misunderstood and over-simplified, as many still think this simply refers to having more than one conventional CPU. In this seminar, we’ll explain how Imagination uses the concept of multiple datapaths and execution units utilising range of different hardware and software architectures to implement high performance, highly scalable IP (Intellectual Property) cores covering graphics (GPU), video (VPU), communications (RPU) as well as CPU functionality. Tony will also explain how Imagination uses this to deliver much more than just performance scaling, including power management, product portfolio, and application software flexibility. : In the past five years, NVIDIA has driven the use of graphics processing units (GPUs) for general-purpose computing tasks from nowhere to a mainstream technology. Today, three of five most powerful supercomputers in the world are powered by GPUs and we see many examples where new science and technology is enabled by faster, better, more accurate simulation applications running on GPU accelerated computers. How can a working computational engineer or scientist take advantage of this new computing paradigm? The simplest way is to use an application that has been ported to GPUs; more and more commercial applications in the fields of structural mechanics, fluid dynamics, computational chemistry, bioinformatics, etc. are being ported to GPUs. For those using high-productivity scripting languages like MATLAB and Mathematica, the latest releases of these packages are accelerated by GPUs. Libraries offer a route to exploit the benefits of a GPU with minimal effort. NVIDIA and our partners provide a broad spectrum of libraries for dense and sparse linear algebra, Fourier transforms, random number generation, image processing, video encoding and decoding etc. Simply replacing calls to libraries running on a CPU with calls to libraries written for the GPU will give an immediate boost in performance. The new KTN will focus on Knowledge Transfer as a stimulus to economic growth. It will seek to deliver improved UK industrial performance by facilitating the development and take up of information and communications technologies and their adoption as key enablers in other industries.